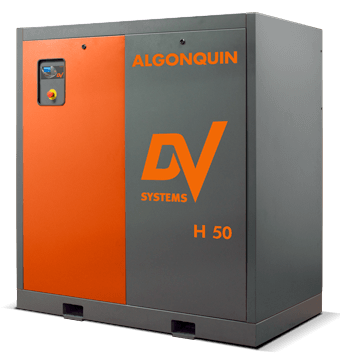 The DV Systems 40HP Rotary Screw Compressor is a heavy duty, high performance and reliable Canadian built air compressor. This unit will keep running at high duty cycles for very extended periods of time. Matched with the CSC300 controller it can be sequenced with up to 8 compressors, optimizing performance and efficiency. The controller also has maintenance reminders, fault log and web enable capability. Match this with an air receiver, air dryer, filters and aluminum piping for a complete compressed air system. Call us to discuss your compressed air needs at 705-722-5747 or email us.